The industry of diving for pearls largely disappeared with the invention of a method for producing a cultured pearl in the early 20th century. Although a romantic notion, pearl diving was an arduous experience. Natural pearls were gathered by pearl divers that would manually search the beds of oceans, lakes and rivers, perhaps finding only 3 or 4 quality pearls for every ton of oysters brought to the surface. Modern diving suits were unavailable, with divers in the Persian Gulf descending on weighted wooden platforms and baskets up to 40 times a day. The rarity of natural pearls pushed divers down to depths of up to 20 metres requiring two to three minute breaths for each dive. Divers would suffer from decompression sickness, the cold waters and deep-sea pressure. Japanese pearl divers, also known as Amas, have a thousand years of diving tradition working on Akoya pearl fisheries and farms. Their trade was passed down the generations from mother to daughter as women were considered better able to hold their breath and endure the cold longer. Ama divers started to work at the age of eleven, even still diving in their sixties or seventies. They provided for their families while their husbands kept the house and brought up the children. Ama divers still work today, but primarily now for the tourist industry. 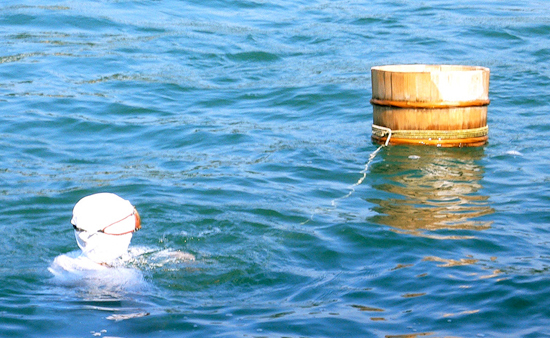 On modern day pearl farms, pearl divers work from boats and offshore inspecting oyster baskets that are suspended in water. Over the course of 18 to 24 months divers may check on an oyster's health, recovering the oyster for cleaning and eventually harvesting of a pearl. The fascination with an image of the pearl diver hunting for pearls will likely persist for many years. Pearls for a Royal Wedding?